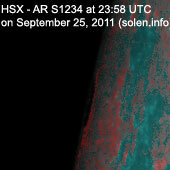 Last major update issued on September 26, 2011 at 04:00 UTC. Last minor update posted at 19:05 UTC. 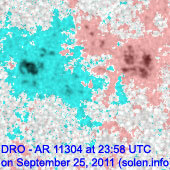 The geomagnetic field was quiet on September 25. 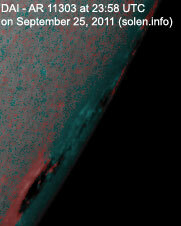 Solar wind speed ranged between 282 and 370 km/s. 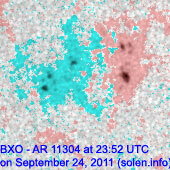 A weak solar wind shock was observed at SOHO at 11:12 UTC, the arrival of the CME associated with the X1 event in region 11302 on September 22. 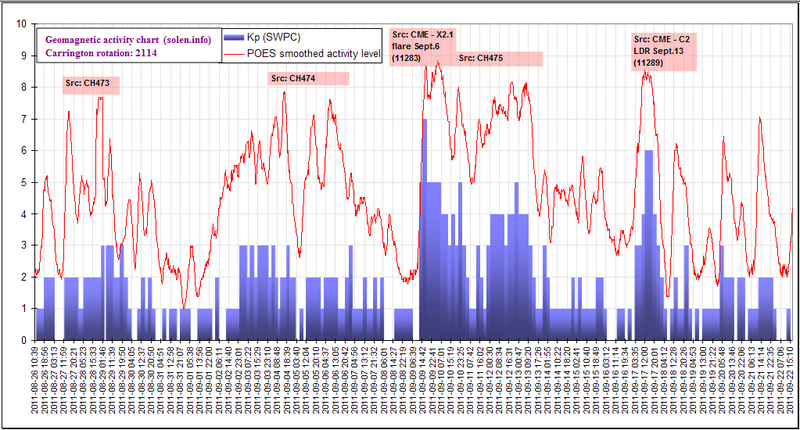 Solar flux measured at 23h UTC on 2.8 GHz was 168.8 (increasing 67.6 over the last solar rotation). The planetary A index was 4 (STAR Ap - based on the mean of three hour interval ap indices: 4.4). 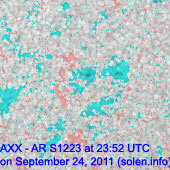 Three hour interval K indices: 10021212 (planetary), 11022322 (Boulder). Region 11301 [N19W11] was mostly unchanged and quiet. 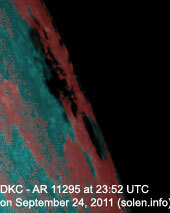 Region 11302 [N13E37] relaxed a little as the strong magnetic delta structure in the central penumbra weakened on the northwestern side. The region remains capable of producing major flares. 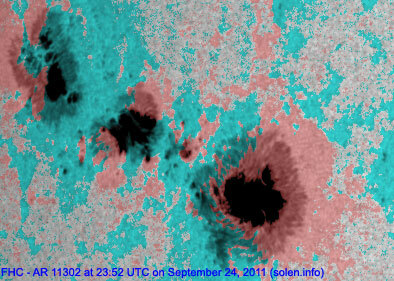 Flares: M4.4 at 02:33, C7.9 at 03:32, major M7.4/1N at 04:50, M3.1/1N at 08:49, C5.7 at 11:29, M3.7 at 15:33, M2.2 at 16:58 UTC. 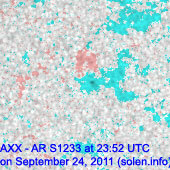 Region 11303 [S27W80] developed further is it rotated to the southwest limb. 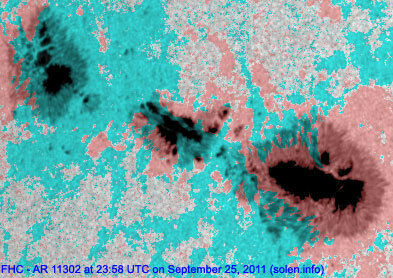 The region could produce further M class flares while at the limb. 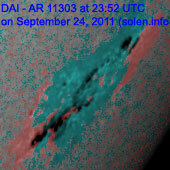 Flares: M1.3 at 07:05 (not reported by SWPC), M1.5 at 09:35, M1.1 at 16:18 UTC. 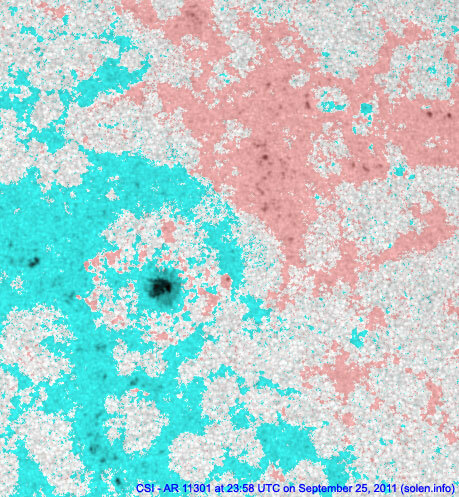 Region 11304 [N12E08] developed slowly and was quiet. 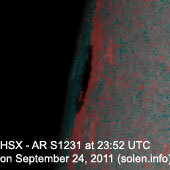 New region 11305 [N12E70] rotated into view at the northeast limb on September 24 and was numbered by SWPC the next day. 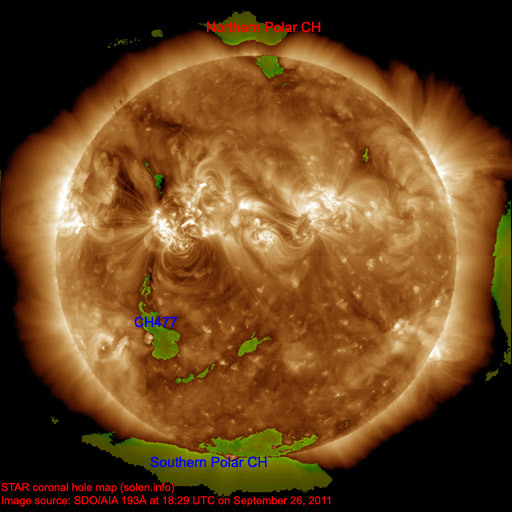 Minor update added at 12:05 UTC on September 26: A strong solar wind shock was observed at ACE near 11:50 UTC. 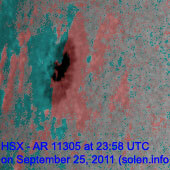 This is the arrival of the CME associated with the M7 LDE on September 24. Major geomagnetic storming is possible for the remainder of the day. Minor update added at 19:05 UTC: The interplanetary magnetic field has at times been strongly southwards after 15h UTC. 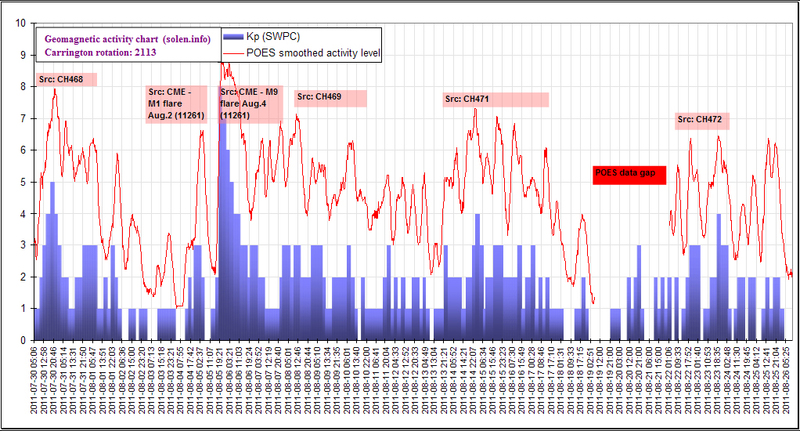 This resulted in very severe geomagnetic storming (Kp 8), the planetary 3-hour A index was 178 for the 15-18h interval. K9 - extremely severe geomagnetic storming is possible for the remainder of today and the first half of September 27. 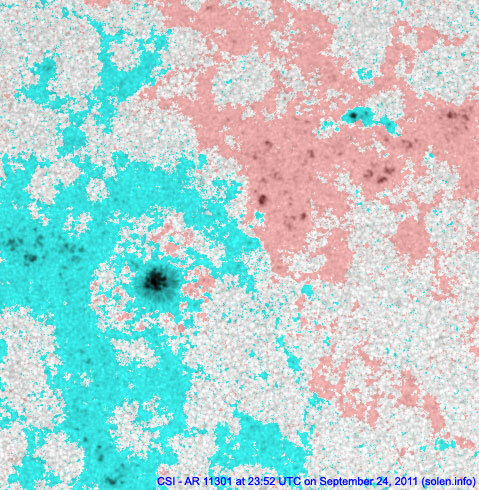 September 25: Most of the CMEs observed during the day had their origin in region 11303, no large CMEs were observed from region 11302. 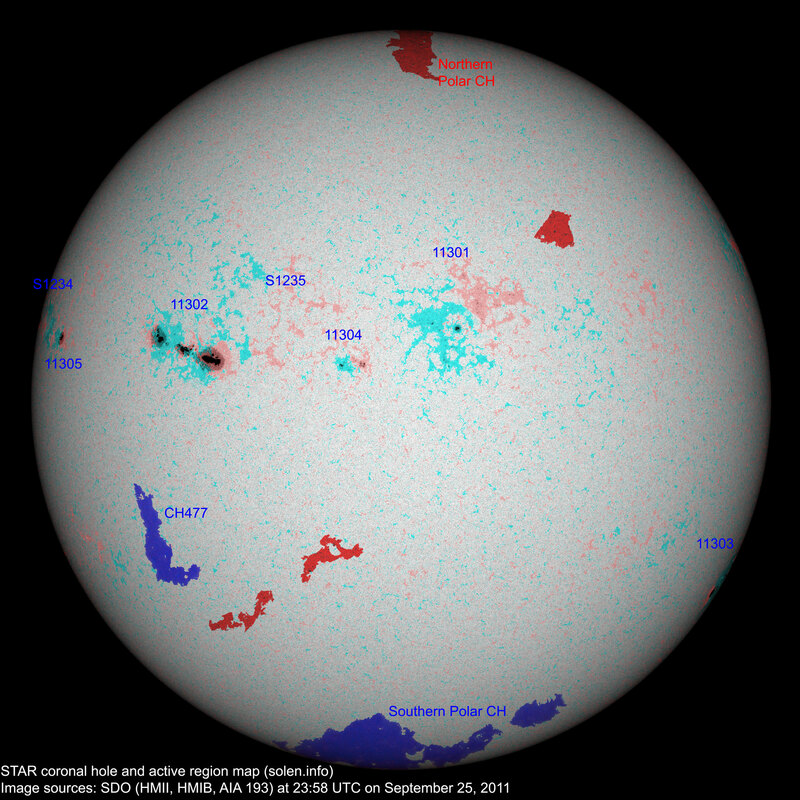 The geomagnetic field is expected to be initially quiet on September 26. The CME observed on September 24 following an M7 flare in region 11302 could arrive during the day and cause unsettled to minor storm conditions. 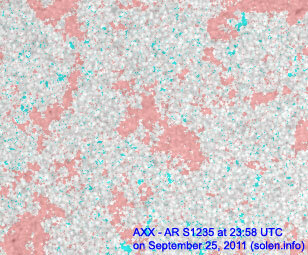 Quiet to active is likely on September 27 becoming quiet to unsettled on September 28.